William Ellsworth Coller was listed as "Willie" in the 1870 Michigan census. He was 9 years old and lived on the family farm in Newton Township, Calhoun County, Michigan. 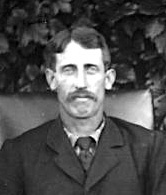 In the 1880 U.S. Census William was "working on farm" in Newton, Calhoun County, Michigan. He was listed as 17 years old. The household record in the 1880 census listed the family as Amanda M. Coller, Lafayette Coller and William Coller. As an adult, William Ellsworth Coller was a farmer, invested in real estate and loaned money. Recollection by Karen Coller Curell - Grandpa loaned money to people. Abel Caines also did this. I figured Grandma maybe encouraged Grandpa to do this. They would charge interest for the use of the money. When my folks and I would go for Sunday drives, we would come across barns and other things my Dad would say Grandpa had not received payment for. He did not believe in banks. When the house burned, a radio burned in a bedroom upstairs. Grandpa was very upset because he had money hid in the radio, not dollars but a lot of money. The property of William Ellsworth Coller was located in sections 11 and 12 of Lamotte Township, Sanilac County, Michigan. 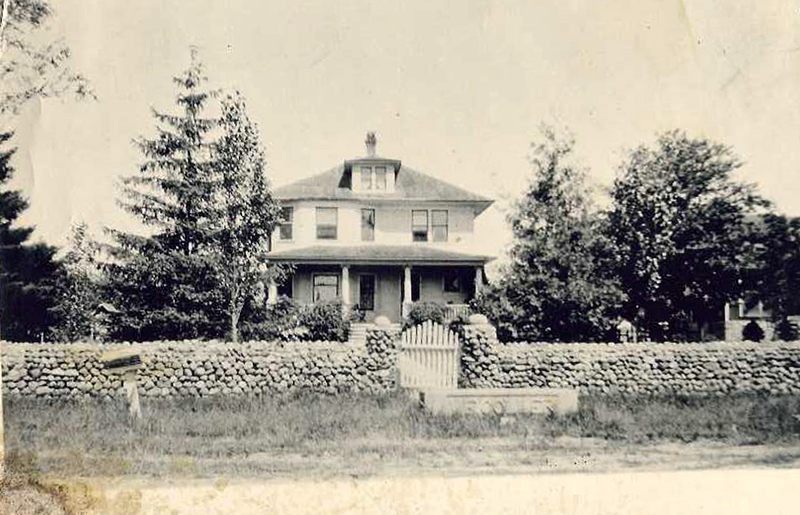 Using current road names, the house was located on the east side of Germania just south of Mushroom. This is northeast of Decker. The address is 2220 N. Germania Road. According the Karen Coller Curell, the "grand" house burned down in 1943. This was actually the second home at this location. The first was torn down to build the "grand" house. William and Ada lived in a woodshed that was located behind the house while it was being rebuilt. This was the same woodshed where William McKinley Coller was born in 1895. The picture below shows the last home built on this location. Building materials were hard to come by during WWII. When William Ellsworth Coller was getting on in years, the family pleaded with his son, Donald Granville Coller, to move back to the farm and help. Donald left a good job with Ford. He and Ellsworth did the farming. Because of the this, Donald and Ellsworth were to get a major interest in the farm. When William Ellsworth Coller died, his will disappeared from the house and the property had to go through probate. The court determined that everything had to be sold and divided equally among the survivors. One of William's children admitted taking and disposing of the will in a deathbed confession. This incident caused bad feelings in the Coller family for a couple of generations. Richart Family Notes, letter of 13 Aug 1949 to William's children: "Dear Cousins, every one and all: I was very much grieved to get word of the death of your Father, my own Cousin Will Coller. Iva signed her first name only to the Memorial Card which she sent me from Snover with your printed address on the evelope. So I am writing to you all; not knowing any more about Iva. We, Sister Franc and I, were so glad that summer day a few years ago when your Father and Mother drove into our yard and made us a call, all too short to get reacquainted. They were a grand heroic pair, your parents, to start out when young like they did to make for themselves a home in the wilderness of Michigan's thumb district. When your Father was a youngster, he would accompany his Mother (your Grandmother) on those rare occasions when she would come to Macon to visit her parents . . . and the rest of the family." 2. Land: Lamotte Township, Sanilac County, Michigan. 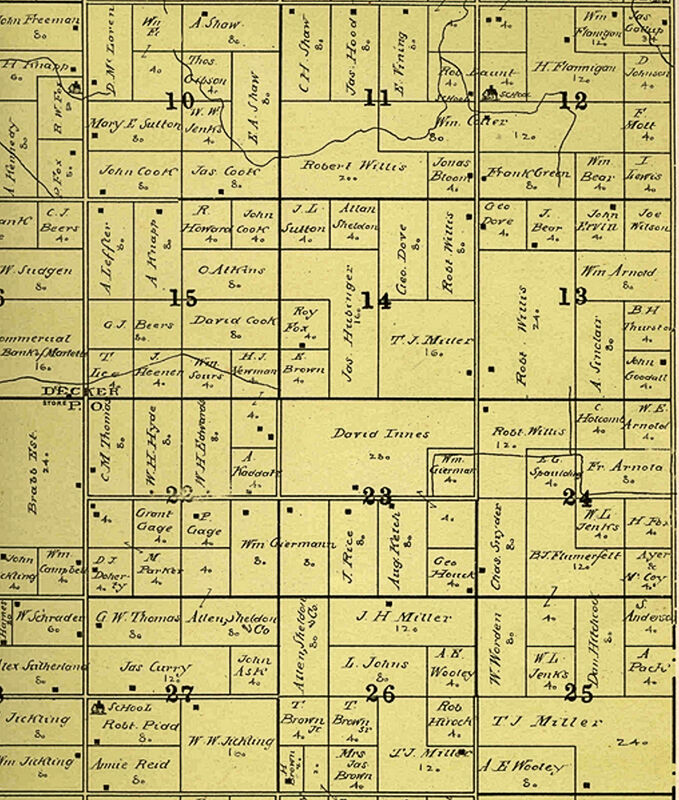 The index to the 1894/1906 Sanilac County land index shows that William E. Coller owned property in section 12 of Lamotte Township, Sanilac County, Michigan in 1894. 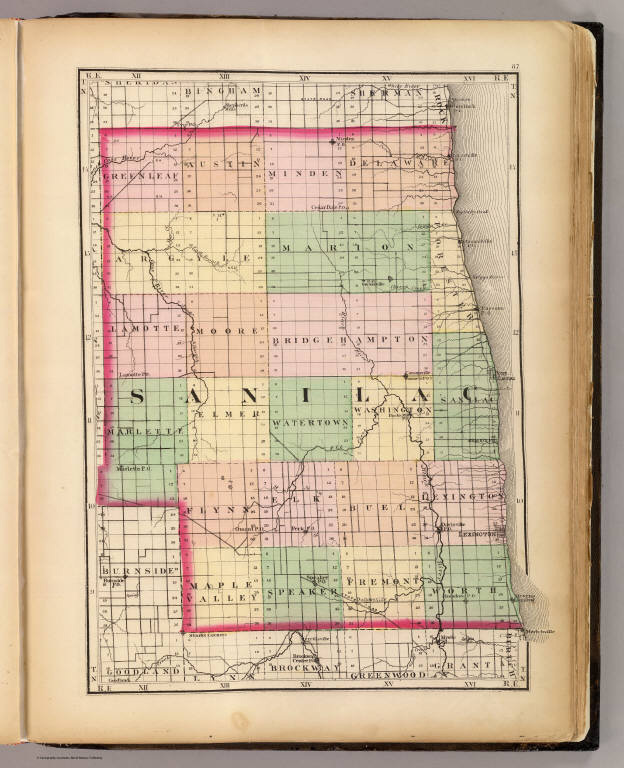 It also states that in 1906, he owned land in sections 11 and 12. The farm is shown in the 1906 Lamotte Township plat map. 3. Alt. Birth, 1863. 1880 U.S. Census lists William Coller as 17 in 1880. This would make his birth year 1863. Different census listing the same indivudual's age at that time do not always calculate back to the same birth year. There may be a variation of a couple of years. 4. Place: Decker, Sanilac County, Michigan. 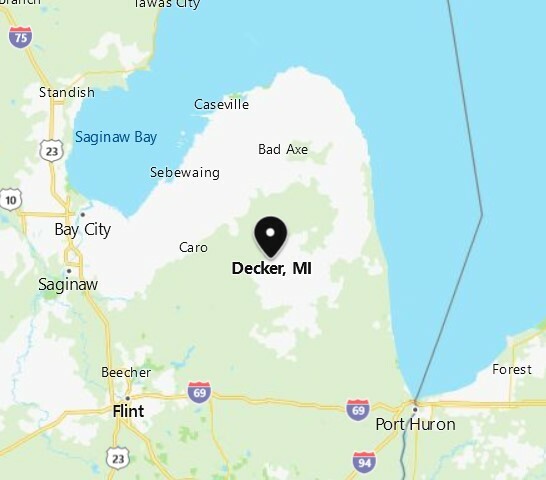 This map shows the location of Decker which is in the center of Lamotte Township, Sanilac County, Michigan. Snover is a few miles directly east. 5. Place: Sanilac County, Michigan, 1873. This map also shows the townships. 6. 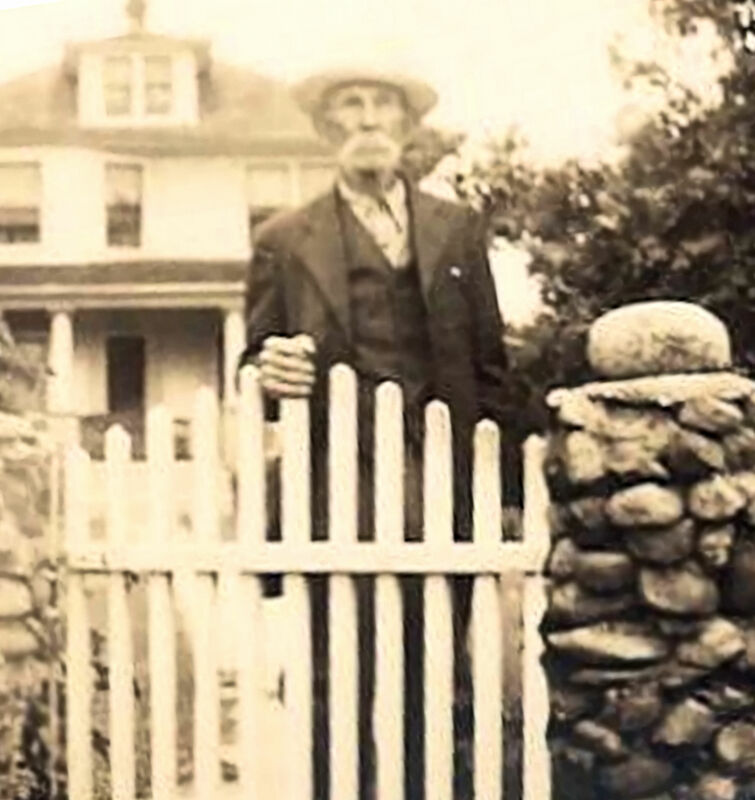 Picture: William Coller at front gate, 1940, 2220 N. Germania Road, Sanilac County, Michigan. This picture shows William Coller at the front gate of the grand house which burned down in 1943. 7. Picture: The "Grand House," Bef 1943, 2220 S. Germania Road, Sanilac County, Michigan. 8. 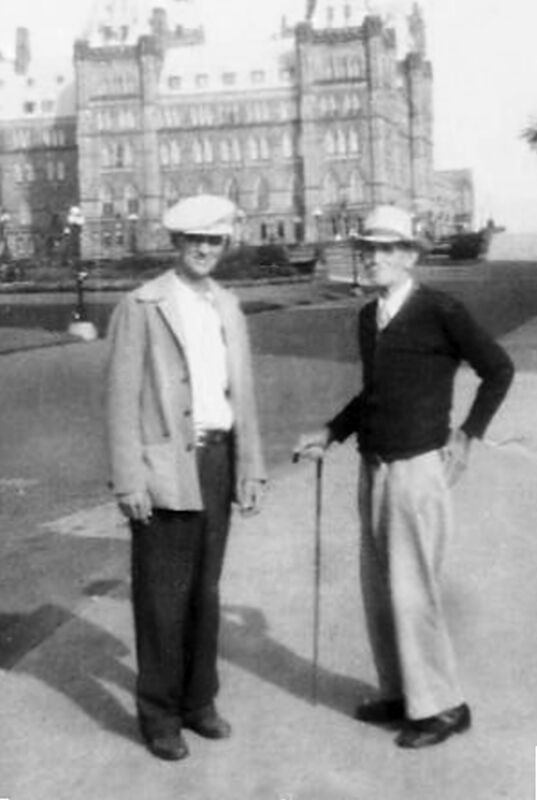 Picture: William Ellsworth Coller and his son William McKinley Coller: Parliament Hill, Ottawa, Canada. 9. 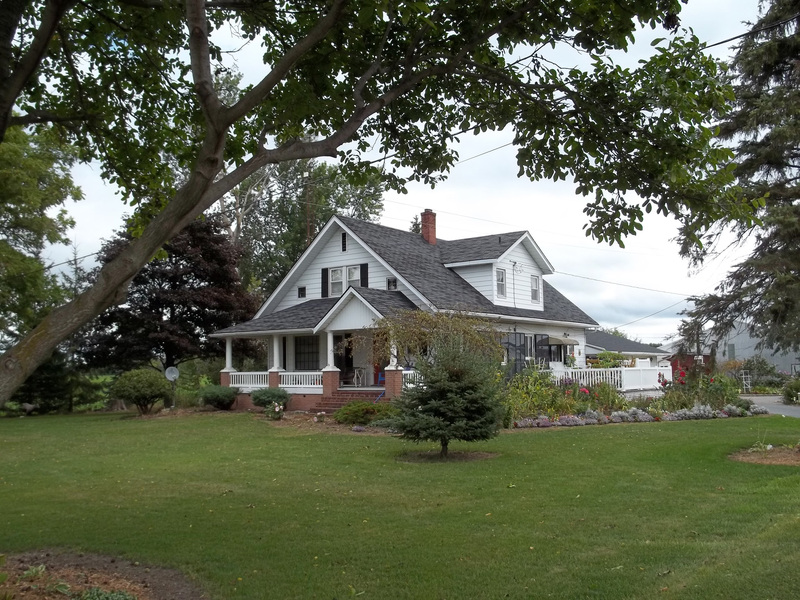 Picture: Coller farmhouse, 2011, 2220 S. Germania Road, Sanilac County, Michigan. This is the third home built on the same location. The first was replaced by the "Grand" house which burned down in 1943. This was the new home built during WWII. Materials were hard to come by during the war which made building the new home difficult.